Scribner Book Company, 9781476784977, 192pp. Winner of the Jesse H. Jones Award for Best Work of Fiction from the Texas Institute of Letters * A San Francisco Chronicle Recommended Book of 2015 * Fiction Finalist for the 2015 Writers' League of Texas Book Awards * A Kirkus Reviews Best Book of 2015 * One of the Texas Observer's "Five Books We Loved in 2015" * One of PRI's "The World's Five Books You Should Read in 2016"
"Profound and wrenching...A deeply moving chronicle of one family's collective devastation, full of remarkable wisdom and humor" (The New York Times Book Review) that follows the members of a wealthy Mexican family after their patriarch is kidnapped. On an unremarkable night, Jos Victoriano Arteaga--the head of a thriving Mexico City family--vanishes on his way home from work. The Arteagas find few answers; the full truth of what happened to Arteaga is lost to the shadows of Mexico's vast underworld. But soon packages arrive to the family house, offering horrifying clues. Fear, guilt, and the prospect of financial ruin fracture the once-proud family and scatter them across the globe, yet delicate threads still hold them together: in a swimming pool in Palo Alto, Arteaga's grandson struggles to make sense of the grief that has hobbled his family; in Mexico City, Arteaga's mistress alternates between rage and heartbreak as she waits, in growing panic, for her lover's return; in Austin, the Arteagas' housekeeper tries to piece together a second life in an alienating new land; in Madrid, Arteaga's son takes his dog through the hot and unforgiving streets, in search of his father's ghost. 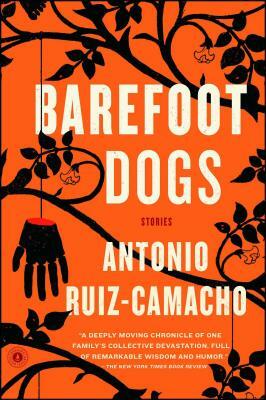 A stunningly original exploration of the wages of a hidden war, Barefoot Dogs is a heartfelt elegy to the stolen innocence of every family struck by tragedy. Urgent and vital fiction, "these powerful stories are worthy of rereading in order to fully digest the far-reaching implications of one man's disappearance...this singular book affords the reader the chance to step inside a world of privilege and loss, and understand how the two are inextricably intertwined" (San Francisco Chronicle).